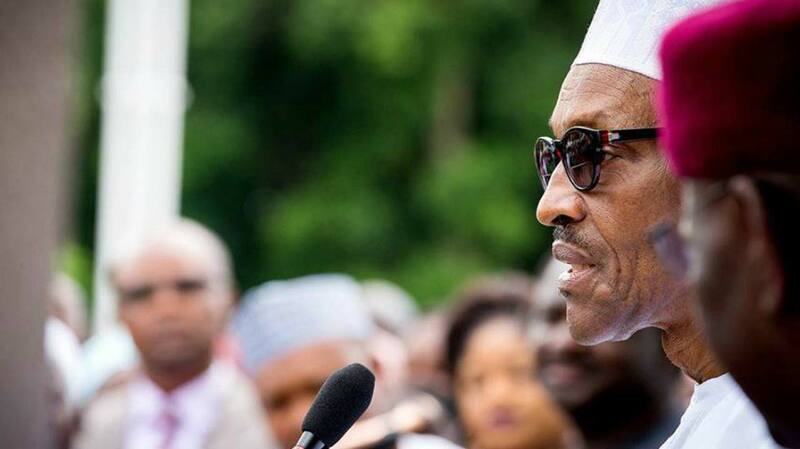 Come back home too, Buhari taunts London protesters | Welcome to Dare Lasisi's blog! President Muhammadu Buhari yesterday taunted critics and protesters of his over 100 days medical sojourn in London, United Kingdom (UK) even as he thanked Nigerians who prayed for his speedy recovery devoid of political and religious affiliations. In a veiled reference to the #ResumeOrResign campaign group who had laid siege at his Nigeria House ‎temporary abode while in the UK, President Buhari who played host to the Nigerian Governors Forum (NGF) in the presidential villa, yesterday, asked the protesters to also return back to the country. He prayed that they are not stuck there so that they do not experience the effect of Brexit and consequences of tax evasion.His words: “I am very happy with the prayers, it was very covered and reported across religions and ethnics. People ‎were praying. He stressed that while in London, he closely followed events back home and was impressed with how they had been tackling inadequate food production because huge food imports were taking a toll on the Naira. “I had so much time to watch television, NTA, I heard so much information about the states. I am very pleased with the states, you are all doing your best and it is proving to be good enough on agriculture and solid minerals. You are succeeding in agriculture because I think people cannot afford foreign food. “The devaluation of the Naira is not my making; it may not favour us but it is something we cannot change. Some people were asking me if we should be more strict on the border, but I want to thank God this year is better than what it used to be. Speaking at the occasion, the Governor of Zamfara State and Chairman of the Nigerian Governors’ Forum (NGF), Abdullaziz Yari, said that when President Buhari came on board in 2015, some State Governors were owing salaries but with the bailout approved by the President and the Paris Club refunds, states have paid the backlog of salaries. Also speaking, Governor Dave Umayi of Ebonyi State reiterated the commitment of State governors to the unity of the country and promised to assist the administration in improving the wellbeing of Nigerians. Fielding questions from State House Correspondents after the meeting, Kogi State Governor, Yahaya Bello, c‎ommended Nigerians who stood behind and prayed for President during his medical travails. “Our President went to take care of his health and now he is back healthy and healthier than before. We are here to appreciate him. We thank Almighty God that he is back safely. “We equally thank his able lieutenant, Professor Yemi Osinbajo, who held the country firm in his absence. That is the demonstration of teamwork. It has equally shown that Nigerians selected the best and elected the best in 2015 general elections and today Nigeria is better for it. Also fielding questions, the Governor of Plateau State, Simon Lalung, ‎who expressed gratitude to God for bringing back President Buhari, prayed that God will continue to guide him as he strives to tackle the challenges of governance in Nigeria. He also commended Vice President Yemi Osinbajo for piloting the affairs of the country while the President was away. “We must commend him. In the absence of the president, there was no vacuum because the Acting President filled in the gap and did his best up to this moment and showed absolute loyalty both to the nation and Mr. President. Yesterday, President Buhari also observed the Juma’at prayers at the presidential villa mosque for the first time in over three months. He was joined by other worshippers including state governors, top government officials as well as Muslim staff of State House for the prayers. The president returned last Saturday from a medical follow-up over an undisclosed ailment in London, UK after about 103 days in that country. Shortly before the prayers were to commence, Special Adviser to the President on Media and Publicity, Femi Adesina, sent a message to State House correspondents that cameras would not be allowed in the mosque from now henceforth.